SUBARU'S camera-based safety software is now taking a look at the driver. 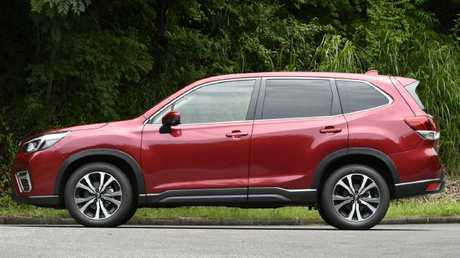 Facial recognition in the new Forester mid-size SUV due here in September not only monitors the driver for drowsiness and distraction but also will move the seat, side mirrors, airconditioning and infotainment to the individual's preferred settings. Subaru Australia managing director Colin Christie says the new feature reflects changing priorities for car owners and aims to take away some of the tedium of sharing a car. "It might sound like a small thing but when a car is driven by multiple family members, changing seat position and mirror angles is a constant frustration," Christie says. "Other brands have similar technology that monitors drivers from a safety aspect, ours extends that to convenience." Subaru Forester: Cargo space has grown to 498L. The software will recognise up to five faces - and had no problem identifying this driver with or without sunglasses. Beyond identifying fatigue based on how often the drivers blink, it also beeps if they takes their eyes off the road for more than a moment. 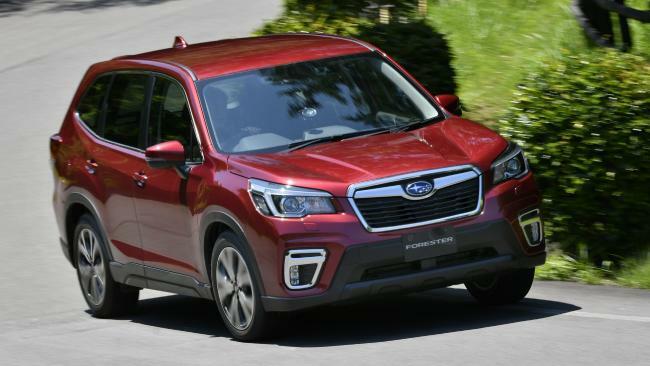 Christie says feedback from Australian owners has been built into this Forester in terms of a large rear cargo opening - which will now take a golf bag sideways - and a powered tailgate that opens and shuts in about half the time of the fourth-generation vehicle. 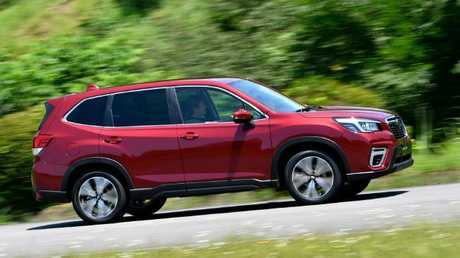 The Forester will be the first Subaru to have active driving grownndard across the range, from the base version to the blinged-up grade. Other notable changes include a 15mm longer, 20mm wider and 10mm lower body with increased passenger space and a direct-injection 2.5-litre engine. Subaru has deleted the existing diesel and 2.0-litre petrol engines, both the naturally aspirated and performance turbo. Even with the new body, it will take a trainspotter to pick how it differs from the outgoing model. 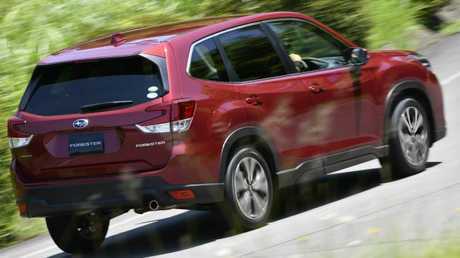 Operating on the premise that the Forester is appreciated for its boxy looks, Subaru hasn't tinkered much with the formula. The grille is deeper, the lights front and rear get a more modern design and fog lights are reshaped and repositioned. Subaru Forester keeps its boxy looks. The windows have been lengthened and the side mirrors repositioned to enhance the already good all-round vision. Rear seat access is easier courtesy of larger and wider-opening doors. The cargo area has grown in volume from 422L to 498L, or 1768L with the rear seats folded. 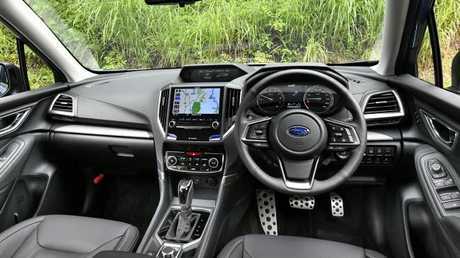 Inside the interior retains a conventional look, though the quality of the plastics and trim will earn comparison with the newest arrivals in the segment. Other niceties include rear vents mounted behind the console bin, along with a pair of USB ports. The air vents separating the multifunction display from the infotainment screen have been relocated to either side of the centre stack but overall the cabin will look reassuringly familiar to existing owners. The Forester was launched on an outdoor cycling track at the Japan Cycle Sports Centre. The course is about 6km with decent elevation changes and corners ranging from fast sweepers to 180-degree hairpins, on which Subaru showed how the SUV's stiffer chassis and suspension revisions have reduced body roll. The new Forester has noticablyt reduce body roll compared to previous versions. It didn't present much in the way of bumps - with one major exception - so a decent assessment of its handling on lumpy local roads will have to wait until September. What is apparent is the new model doesn't pitch or squat nearly as much under acceleration or braking. The steering feels marginally more responsive and the revised variable ratio steering makes changes of direction smoother and faster. Switch the continuously variable transmission into manual mode and there are now seven steps instead of six. With the paddle-shifters in use, the engine sounds noisy when being pushed to the top end of the rev range, which is where peak power is found. The family SUV is equipped with a number of active driver aids. The noise is less intrusive in the default auto mode, which doesn't seem to affect the car's acceleration, so we'd recommend letting the CVT do its own thing. A brief off-road test highlighted the adjustments made to the X-Mode software to help drivers in low-grip conditions. There's the standard snow and mud mode along with a new deep snow and mud option that disables traction control. Forester project manager Tomoyuki Numone says the changes were made because owners didn't manually override the traction control when circumstances required. Now, if they get stuck in the thick of it, they can twirl the dial for a more aggressive all-wheel drive set-up.